With so many great islands out there, how do you find the destination that’s right for you? It’s impossible to write a single article that will help everyone find what they’re looking for, but, after thorough research, I’ve chosen to spotlight eight island destinations that are worth considering for your next trip. The lineup offers something for everyone, whether you want a budget-friendly locale with great beaches or an exotic hideaway none of your friends have ever been to. It’s hard to believe that honeymooners, history buffs, foodies, club hoppers, and backpackers on a budget could all find exactly what they are looking for in one destination, but the 30-square mile Greek Island of Santorini seems to fulfill the expectations of many different types of travelers. The island’s crescent shape—an arc of sheer cliffs that drop into the sea—was caused by the explosion of a volcano around 1,500 B.C., which also wiped out the island’s prehistoric civilization. Some archeologists believe that this lost civilization is the mythical city of Atlantis. Whatever you may think, Santorini has treasures for all to discover. Outside Fira and Oia, you can go to one of Santorini’s famous black- and red-sand beaches, such as Kamari or Paralia Kokkini. Or, head inland to visit one of the island’s smaller towns, like Episkopi Gonia, which has a 12th-century Byzantine church, and Pyrgos, a village known for its elaborate Easter celebrations. Touring Santorini’s ruins is also a must, particularly Akrotiri, the “Pompeii of the Aegean.” (Editor’s note: The site is currently closed for renovations, although you can still walk up to it. According to the Greek National Tourism Organization, it will likely reopen in spring 2007.) “Akrotiri is amazing,” says Carrie Swan, an archeology PhD student at Brown University who has visited the site several times. “Because the site is covered, the preservation is very extensive, and you see things like two- and three-story buildings, huge pithoi pottery containers, and wall paintings.” You should also visit Ancient Thera, a Classical Period city founded in the ninth century B.C. To learn more about the island and where to stay, check out Santorini.com, Travel-to-Santorini.com, and Santorini.net. Average Santorini hotel rates range from $38 to $949 per night on TripAdvisor. From the U.S., the quickest way to get to the island is to fly to Athens and then hop on an Aegean Air flight to Santorini. In November, round-trip flights from New York to Athens start at $628 including taxes on United and Lufthansa, and flights from Athens to Santorini on Aegean Airlines start at $48 round-trip, plus taxes. How is it that wee Saba, a little-known five-square-mile island in the Netherlands Antilles, got singled out as the “Best Island in the Caribbean, Bermuda, and the Bahamas” by readers of Travel + Leisure for the magazine’s 2006 World’s Best Awards when so many more flashy, popular beauties were in contention? Maybe unspoiled, natural beauty is the new black among island aficionados. The rain-forest covered summit of a dormant volcano, Saba sits like a big green gumdrop dropped in the blue sea, about 28 miles north of St. Maarten. The volcanic peaks and cones of Saba rise steeply from the sea to a height of 2,864 feet, and the island’s four villages—The Bottom, Hell’s Gate, Windwardside, and Zion’s Hill—are perched on its slopes in clusters of red-roofed gingerbread houses. A single road (called “The Road”) connects them; hiking trails and foot paths crisscross the interior. Beach bunnies won’t find much sand along the rocky coast, but the island is paradise for hikers, and its surrounding waters have some of the most pristine dive sites in the Caribbean. The highest point on the volcano’s crater (and the highest point in the entire kingdom of the Netherlands), Mt. Scenery, can be reached via a strenuous three-hour round-trip climb that passes through palm stands and an elfin forest filled with tree ferns and orchids. On a clear day, you can see St. Kitts, St. Eustatius, St. Maarten, and St. Barts. A protected marine park that surrounds the entire island was created in 1987, just as dive sites were beginning to be established. Thanks to this protection, Saba’s reefs are undamaged—an anomaly in the Caribbean. There are three dive shops on the island that can take experienced divers to some of the park’s 25 established dive sites. Some of the most exciting sites are around the “pinnacles”: underwater volcanic mountains that are covered in coral and sponges and attract a variety of colorful fish, sharks, and sea turtles. Tourism is relatively new to the island—there wasn’t an airport until 1963 and its boat pier wasn’t completed until 1972—and Saba’s 1,500 residents have sought to protect their environment and keep all tourist development eco-friendly. They’ve also managed to keep it virtually crime-free. “Not only do we never lock any cottages or our house, we have never even owned a key for our home,” says Angelika Hartleib, owner of El Momo Cottages in Windwardside (double-occupancy rates start at $50 per night). The Saba Tourist Office website is an excellent planning resource, providing detailed information and links about the island’s hotels, restaurants, activities, environment, and culture. On TripAdvisor, average Saba hotel rates range from $75 to $350 per night. To get to Saba, you must first fly to St. Maarten, and then take a short flight or boat ride to the island. From the St. Maarten airport, you can hop on a Winair flight for a 15-minute journey to Saba’s Juancho E. Yrausquin Airport. Flights in January start at $75 round-trip, including taxes. For boat travel to Saba from St. Maarten, you can opt for an hour-and-45-minute trip from Phillipsburg on the Dawn II for $60 round-trip or an hour-and-15-minute trip from Simpson Bay on the Edge for $65 round-trip. Hvar may be an unfamilar name to you, but this sun-kissed island off the coast of Croatia has been discovered by celebrities and jetsetters like Bill Gates and Gwyneth Paltrow and is on its way to becoming the next St. Tropez (New York Times article; free registration required). The war in the Balkans kept mass tourism at bay during the 90s, and the island’s ancient towns and rugged hills still maintain their integrity. But, it’s worth visiting soon—prices are going up with its growing popularity and, before you know it, Pamela Anderson will be making it the setting of her next wedding. “Arriving by boat is the perfect way to approach Hvar,” says SmarterTravel Contributing Editor RaeJean Stokes, who visited the island in 2004. “You’ll see green, lavender-covered mountains drop directly into an azure colored Adriatic.” Hvar town is the main attraction on this 40-mile island, boasting a beautiful 13th-century piazza with polished white stones, 15th- and 16th-century churches, and a medieval fortress. In the evenings you can dine at restaurants serving typical Mediterranean cuisine and seafood and then hang out at the clubs and bars with all the hipsters. Sunning and swimming at the island’s gorgeous white-stone beaches are the most popular pursuits during the day. “The beaches are decidedly European with liberal attitudes in regards to swimwear,” says Stokes. Or, to get away from the crowds, you can visit some of the island’s other towns and villages like Stari Grad and Jelsa, or head out into the countryside to see lavender fields, vineyards, and olive groves. “The scent of lavender fills the air everywhere you go,” says Stokes. To learn more about where to stay, where to eat, and what to do, go to the official Hvar tourism website. 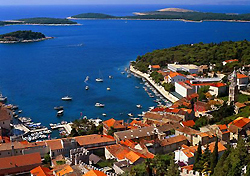 Average Hvar hotel rates range from $23 to $204 per night on TripAdvisor. If you’re not sailing your own yacht, you can reach the island by ferry from the city of Split on mainland Croatia. You can fly to Split from New York in May 2007 on British Airways for $941 round-trip including taxes and fees. Cottages by the water, ice cream, flip-flops and tank tops, dining alfresco, and afternoons spent at the beach or doing nothing at all—it’s the all-American summer vacation. Many have discovered—from the Clintons and Kennedys to ordinary New Englanders—no place does it like Martha’s Vineyard. “The atmosphere on the island makes Martha’s Vineyard a classic American summer retreat,” says SmarterTravel’s Executive Editor Anne Banas, a frequent visitor who recently spent a week on the island in August. “Everyone should head to the beaches. My favorites were Long Point Wildlife Refuge Beach, which limits access so it feels more private, and Katama near Edgartown. The surf was wonderfully rougher than other areas, and the sand, which swept upwards into marshy dunes, was perfectly white. Learn more about the island by visiting the Martha’s Vineyard Chamber of Commerce website, where you’ll find info about how to get to the island, where to stay, activities, and more. Average hotel rates range from $82 to $404 per night on TripAdvisor. The Chamber of Commerce site also links to rental agencies where you can find vacation homes to rent. Besides the island-specific rental sites, you might also try Vacation Rentals by Owner. Most people get to Martha’s Vineyard by ferry. Ferries depart from Hyannis, Falmouth, and Woods Hole on Cape Cod, plus New Bedford and Quonset Point, Rhode Island. The cheapest way to get there is by taking the Island Queen ferry from Falmouth ($12 round-trip; 40 minutes each way). If you have a car, you’ll have to take a Steamship Authority ferry from Woods Hole ($13 round-trip per adult; car fares start at $72 round-trip). You can also reach Martha’s Vineyard by flying Cape Air from Boston, New Bedford, Hyannis, or Provincetown, or on US Airways Express from New York’s LaGuardia airport, Washington D.C.’s National airport, Philadelphia, or Hyannis. You don’t need a passport to discover authentic Scottish Gaelic culture. On Nova Scotia’s Cape Breton Island, where thousands of descendants of 19th-century Scottish immigrants live, you’ll find a Gaelic culture that’s living and in many ways unchanged from the way it was a hundred years ago. A good place to start learning about the culture is the Highland Village Museum ($7), a living history museum and Gaelic research and preservation center on the Iona Peninsula. Then, stop by the Celtic Music Interpretive Centre in Judique to see demonstrations ($4) of fiddling, bagpiping, and other musical styles and tour the Glenora Inn & Distillery ($6) in Glenville, home of North America’s only single malt whiskey distillery. If you have more time, you might want to sign up for a multi-day course at The Gaelic College in Englishtown that covers Gaelic arts such as highland dance and Cape Breton fiddling. Plus, you can take part in one of the many Gaelic festivals, like the Festival of Cape Breton Fiddling in August or the Celtic Colours Festival in October. Like Scotland, Cape Breton is also known for its spectacular scenery, although the island’s thick deciduous forests and seasonal extremes are distinctive of Eastern Canada. For some of the best views of this wilderness, drive the Cabot Trail, a 185-mile loop that weaves along the island’s spectacular coastline and surrounds Highlands National Park. For information on accommodations, dining, and activities on Cape Breton, visit the Cape Breton Island Travel website. Average Cape Breton hotel rates range from $40 to $311 per night on TripAdvisor. You can reach Cape Breton by flying to the island’s airport, Sydney International. Round-trip fares from New York on Air Canada for travel next June (the beginning of the summer tourist season) start at $634 round-trip, including taxes and fees. As the oldest colony in the British Empire, Bermuda still retains many British customs, like having afternoon tea and wearing wigs in parliament. Most importantly though, Bermuda puts civility and politeness before all else. Any development here is regulated by strict rules, the number of cars is limited, gentlemen are expected to wear jackets and ties at dinner, and the environment is under the protection of the world’s first environmental laws. The Bermuda Department of Tourism will have you know that, “contrary to popular belief,” its island is not in the Caribbean or the Bahamas—its quite separate and unique. Bermuda is in fact closer to New York City (774 miles away) than the Bahamas (940 miles away), and on about the same latitude as Charleston, South Carolina. Unlike many Caribbean islands, Bermuda’s residents enjoy a high standard of living and tourists are not separated from the locals in prison-like resort compounds. Everyone here is part of one civil society. The island’s tourism infrastructure is designed to please honeymooners, celebrities, golfers, and anyone looking for a classy, cultured getaway. Bermuda offers the sophisticated traveler miles of beautiful white- and pink-sand beaches, luxurious hotels and quaint guest houses, spas, high-end shops and art galleries, historic sites to explore, and lots of tennis and golf. With eight golf courses spread over its 21-square-mile area, Bermuda has more golf courses per square mile than anywhere else on earth. “It’s a paradise for golfers,” says SmarterTravel’s Editor-in-Chief Ed Passarella, who particularly enjoyed playing the challenging par-three course at the Fairmont South Hampton. The island also draws many visitors for seven annual “signature” cultural events and festivals. Highlights include the Bermuda Music Festival and the Bermuda Gourmet Getaway in October and the Bermuda Festival of the Performing Arts in January and February. Visit the Bermuda Department of Tourism website for general travel information and the Bermuda Hotel Association website to learn about accommodation options and find hotel specials. Average Bermuda hotel rates range from $60 to $489 per night on TripAdvisor. From the East Coast, you reach Bermuda via a quick two-and-a-half to three-hour flight. Several major U.S. carriers including low-cost airlines JetBlue and USA 3000 have regularly scheduled service. For midweek flights in February, American and JetBlue have round-trip fares from New York currently starting at $289, including all taxes and fees. With its crystal-clear water, tiny islets covered in palm trees, and emerald green mountains rising from the sea, French Polynesia’s Bora Bora is the tropical paradise myth made real. With the 2,384-foot, knife-shaped Mt. Otemanu at its center, this 15-square-mile island is embraced by a necklace of coral and motus (small islands), creating a protected lagoon. Writer James A. Michener called Bora Bora the most beautiful island in the world, and to many it’s the romantic destination of their dreams. It’s no surprise then that some Bora Bora resorts report 80 percent or more of their guests are honeymooners. Luxurious, private accommodations are an integral part of honeymoons and other romantic getaways, and the hotels and resorts in Bora Bora more than deliver. Most of the resorts are set on the western peninsula of the main island or on one of the motus, affording spectacular views of the mountain and easy access to the lagoon’s warm, shallow water. Fine dining restaurants, on-site spas, and private, over-water bungalows are de rigueur at the top resorts, and glass-floor viewing panels, canopy beds, and marble bathrooms are common room features. Most properties also offer special romance packages and amenities, ranging from breakfast delivered to your bungalow by outrigger canoe to elaborate Polynesian wedding ceremonies. Hotels can usually arrange excursions outside the resort, such as diving, jeep tours, sailing, shark-feeding (a popular activity on Bora Bora), and helicopter flights. Some resorts also have their own unique offerings, such as those of Le Meridien Bora Bora, which has an on-site sea turtle care center where guests can learn about turtles and then swim with them in the resort’s lagoon. Read more about Bora Bora resorts, activities, and romance offerings by visiting the official Tahiti Tourisme North America website. On TripAdvisor, average hotel rates range from $98 to $1,246 per night. It’s a haul to Bora Bora, requiring a transpacific journey to Tahiti and then a short interisland flight. In January, round-trip flights from Los Angeles to Tahiti start at $1,601, including taxes, on Air Tahiti Nui. Interisland flights from Tahiti to Bora Bora are $366 round-trip, including taxes on Air Tahiti. If you’re set on a tropical resort getaway for your next vacation but don’t want to blow a ton of cash, the Dominican Republic can offer better value for your money than other resort destinations in the Caribbean and Mexico. Although the “DR” has for years been regarded as a cheap destination, it offers a full spectrum of accommodation options, including numerous upscale resorts in its two most popular beach areas, Puerto Plata and Punta Cana. Many of the of DR’s big chain resorts cost less than comparable chain properties on other Caribbean islands and Cancun and the Riviera Maya. For example, for a seven-night all-inclusive stay during the high season, rates start at $1,722 per couple at the Iberostar Costa Dorada in Puerto Plata and $2,646 per couple at the Iberostar Bavaro in Punta Cana. In contrast, rates at Iberostar resorts in Playa del Carmen, Mexico, are significantly higher. For the same vacation, rates start at $3,752 per couple at the Iberostar Paraiso Lindo and $4,508 per couple at the Iberostar Paraiso Maya. In another instance, for a seven-night all-inclusive stay during the high season, rates start at $1,568 per couple at the ClubHotel Riu Bambu in Punta Cana in contrast to a starting price of $1,946 per couple at the ClubHotel Riu Ocho Rios in Jamaica. Start planning your trip by visiting the official website of the Dominican Republic Ministry of Tourism, which has information about the different regions of the islands. This site doesn’t link directly to DR hotel websites, so you may find the hotel listings with web links on the unofficial Debbie’s Dominican Republic Travel Page more helpful. On TripAdvisor, average hotel rates range from $105 to $626 per night in Punta Cana and $22 to $610 per night in Puerto Plata. Several major U.S. carriers offer nonstop service to both Punta Cana and Puerto Plata. For midweek travel in January (the high season), round-trip flights on Delta from Atlanta start at $560 to Punta Cana and $585 to Puerto Plata. Prices include taxes and fees.